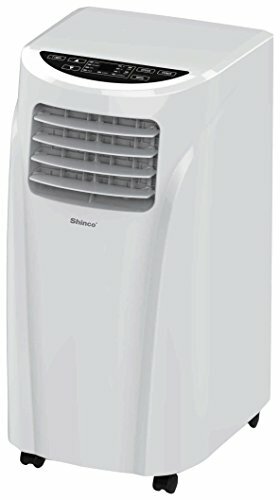 Shinco - 10K BTU : Portable Air Conditioner Review • The Air Geeks, reviews of air conditioners, dehumidifiers and air purifiers. 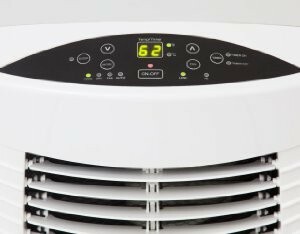 One of the most important factors to consider when choosing an air conditioner for your room is the rated cooling capacity. Air conditioners with high cooling capacities are suitable for large rooms and vice versa. This portable unit is designed to offer a cooling capacity of 10,000 BTU. At this capacity, this sleek unit is ideal for cooling a space of 300 square feet. The system is specially designed to spread the air evenly across the room. In case you are looking for a powerful system for your house, then this unit is designed to transform your space into a comfortable place with cool, clean, and fresh air. In addition, this unit employs a self-evaporative mechanism to eliminate the need for regular emptying of the tank. If your room meets the size specification given by the manufacturer, then this maybe the ideal system for your cooling needs. To begin with, this system is designed to provide the user with cool and fresh air. With a cooling capacity of 10K BTU, this system cools a room within a short time. According to the manufacturer, this portable unit is suitable for rooms that are as big as 300 sq. ft. It is also important to have in mind, however, that the size may be influenced by the design of your house, and the conditions in which it is tested (temperature, humidity, isolation). In our case, with a room around this size and average ambient conditions, this system was able to provide a comfortable environment in a few hours. The overall performance of an air conditioner is significantly influenced by how it is designed to blow air. This unit is capable of blowing air in four directions to ensure that your entire room is cooled and has a comfortable environment. This is very unique, and works well for its 2-speed cooling. This system spreads cool air throughout the room quickly and effectively. Portability, you said? This unit is designed for easy mobility to enable users to move it from one place to another in a stress-free manner. It features wheels and you can therefore wheel it from one position to another without the need to carry it. Furthermore, the system has side handles that enable users to carry it up the stairs easily and comfortably. This unit only weighs 54 pounds and it is therefore lighter than most air conditioners of same cooling capacity. This is a big plus. Everybody likes controlling their devices and systems from anywhere within the room. The Shinco 10K comes with a remote control to enable you to adjust your room environment without walking to where you have positioned it. Moreover, it features a user-friendly interface that is made up of digital controls. With this interface, you can adjust the conditions of your room with ease and convenience. Lastly, manual emptying of an air conditioner’s tank can be tiresome especially when it becomes a routine task. This air conditioner is designed to provide you maximum comfort and does not require regular emptying of the condensate. It utilizes a self-evaporative mechanism that prevents accumulation of the condensate. The system is designed to work effectively and does not come with a water tank. Instead of allowing the condensate to accumulate in a tank, the unit recycles the water and uses it for cooling. Quietness? Remember we are dealing with AC units, there is no such thing as quietness! However, this unit is pretty non-noisy, which we liked. The manufacturer indicates 52-55 dB, we are more inclined to think it ranges within the 58-60 dB according to our measurement. Still quiet enough! Self-evaporative system. The unit uses an effective mechanism that prevents accumulation of the condensate. This eliminates the need for emptying a tank. The system is designed to blow air in four directions. This ensures even distribution of cool and fresh air. As a result, the room cools quickly. Relatively quiet and highly effective. When the system is properly installed, it is capable of cooling a room within 15 minutes. The construction quality can appear cheap. Some pieces, including the window installation kit, look cheap and unlikely to stand the test of time. Evaporative system does not work effectively in humid areas. The mechanism used by this unit does not produce impressive results in humid climates. I have lived in my apartment for close to 8 years now and just suffered through hot days without A/C. It can get up to the high 80s-low 90s on really warm days inside. While it is great for keeping the heat in during the winter, there were stretches I literally couldn’t even stay in my house. With giant sliding windows, I couldn’t just get a decently priced window A/C. With the first hot day this year, I logged on and ended up buying this unit. I have been using it for over a week now and couldn’t be more pleased. I have it in bedroom which is about 14X15. The included window unit was easy to use. The bracket has some holes with a screw so I could adjust for my vertical window which is about 4 feet tall. I had the unit up and running in about 15 minutes. 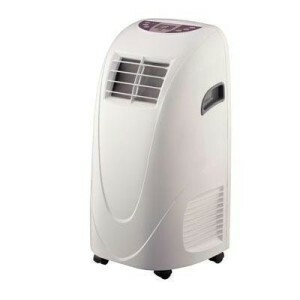 This is my first Portable Air Conditioner. Very easy to assemble in sliding windows. The two-piece window kit will fit up to 52 inches length. My window is wider than 52 inches so I needed to buy some weatherstrips at homedepot to fill the space. This air conditioner works great and fast. Could be a bit noisy for some people if you would like to use this unit in TV room or bed room. The Shinco 10,000 BTU air conditioner is an effective system that offers good performance when properly installed. It cools a room within a short time and does not require manual emptying of the condensate. Its user interface is specially designed to enable you to adjust settings with ease, and its operation is relatively quiet. Does it getter better than this? Yes : we did not like some of the cheap material that was used, which is unlikely to last for 15+ years. Good unit, nonetheless : recommended!